Incisors (from Latin incidere, "to cut") are the front teeth present in most mammals. They are located in the premaxilla above and on the mandible below. Humans have a total of eight (two on each side, top and bottom). Opossums have 18, whereas armadillos have none. 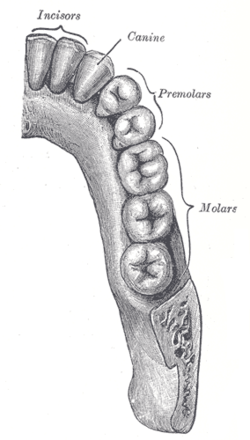 Apart from the first molars, the incisors are also the first permanent teeth to erupt, following the same order as the primary teeth, among themselves. Among other animals, the number varies from species to species. Opossums have 18, whereas armadillos have none. Cats, dogs, foxes, pigs, and horses have twelve. Rodents have four. Rabbits and hares (lagomorphs) were once considered rodents, but are distinguished by having six—one small pair, called "peg teeth", is located directly behind the most anterior pair. Incisors are used to bite off tough foods, such as red meat. Cattle (cows, bulls, etc.) have none on top but a total of six on the bottom. In cats, the incisors are small; biting off meat is done with the canines and the carnassials. In elephants, the upper incisors are modified into curved tusks (unlike with Narwhals, where it is a canine that develops into a straight and twisted tusk). The incisors of rodents grow throughout life and are worn by gnawing. In humans, the incisors serve to cut off pieces of food, as well as in the grip of other food items. Medical animation showing Incisor teeth and its arrangement in the mouth of an adult human being. ^ "Archives". dentalcare.com. Archived from the original on 29 April 2018. Retrieved 29 April 2018. ^ Scheid, RC. (2012). 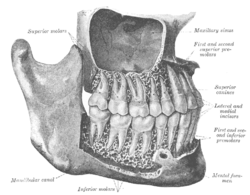 Woelfel's dental anatomy (8 ed.). Philadelphia: Wolters Kluwer Health/Lippincott Williams & Wilkins. ^ Nweeia, Martin; Eichmiller, Frederick C.; Hauschka, Peter V.; Tyler, Ethan; Mead, James G.; Potter, Charles W.; Angnatsiak, David P.; Richard, Pierre R.; et al. (30 March 2012). "Vestigial Tooth Anatomy and Tusk Nomenclature for Monodon Monoceros". The Anatomical Record. 295 (6): 1006–1016. doi:10.1002/ar.22449. PMID 22467529.